Welcome to this musical page of Cloud-Messenger, for all other information, please visit this page. Please click or tap here to read an explanation of this subpage. Due to the high bitrate audio streaming, some data has to be buffered during your first visit. Please be patient after activating the Play button. White circles indicate the buffer progress, red ones represent the musical status bar. (with your mouse-pointer or finger around the White/Red circle, see the image above). If you encounter some problems with playback, please refresh the browser. For basset blockflute & fixed surround media with animation. Much is said about the influence of loneliness and solitude on the human psyche in different historical, scientific and literary writings. One of these is the poem "The Cloud-Messenger" (Meghadūta), written by the greatest Sanskrit poet Kālidāsa in which a Yaksha becomes banished and separated from his young bride because of a curse. This artistic creation is contained within a 45 minute continuous cross-media drama. One dancer and one block-flute player (with the entire family of recorders) present themselves as mixed characters with quasi 3d video reproductions from the second (virtual) dance on the screen. Monotony of a long wait or delight of an expectation before the most wished dream will come true? What mood shall mostly attract your attention here? "No sleep, nor wake" is a moment where the Man slowly "wakes up” after being beaten by the Curse (watch "Thundamned"), but he is not all clear, neither asleep, nor wakened... He can not remember his past, nor even his own bride! All attempts to imagine his lover crash: the curse is too strong and permits only fragments of his lover's body to reappear mentally. The doom prohibits the lovers to be together: neither physically or in fantasies. This could be called the "speech" of the Cloud, but first, after 8 months long of the Dry, he has to spit a tons of water, that all accompanied by a giant storm. After it, the Cloud-Messenger is "able to talk". During the "speak", the performer "talks" to a small microphone that is feeding a vocoder. With a strange combination of words and real time electronics, the audience do really hear a "talking damp". The Cloud redeemed at the end of his "story" and disappears after the last word: a water-drop. The thoughts and memories are getting uncontrolled and the listener have to roam through the mental jungle around. The last, almost aggressive episode "Dust against the Wind", a dramatic fight of a Man who was cursed already over many months and who has been sent miles away to complete solitude, who’s trying now, with all his strength, to defeat the big Curse. Cloud-Messenger is performed by Jorge Isaac. To read his biography, please follow this link. Jorge Isaac (1974, Caracas) recorder player and founder of the Visisonor Foundation. Isaac completed his professional training under the tutelage of Walter van Hauwe at the Amsterdam Conservatory in 2000. In 2002 received his master degree and in 2006 he was appointed as Recorder Professor, all at the same institution. 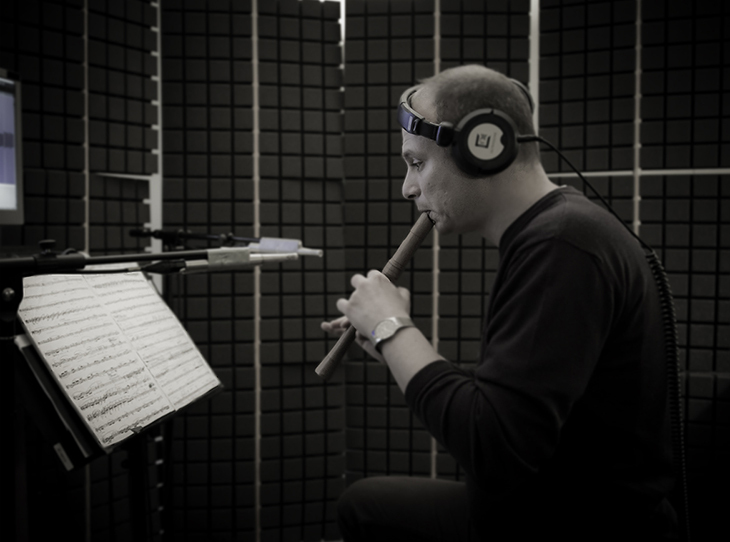 Several international prizes are: the International Gaudeamus Interpreters Competition 2001 (including the special prize "best use of electronics"), the Krzysztof Penderecki International Competition of Contemporary Music in Poland (2001), Jur Naessens Music Award in Amsterdam (2004) with his multimedia production "Mensa Secunda" and Award of Distinction at the Prix Ars Electronica in Austria for his work "Marionette" (2007). Please read some quotes about Cloud-Messenger here. And versatile is the latest production of e.g the Russian-Dutch composer Fred Momotenko. Just as the festival itself had wished ... a creator of today with electronics, projection and magical music for recorder and dance: Cloud Messenger, (Vrije Geluiden , VPRO, Dutch TV broadcast). -The initiative of the Dutch-Russian composer Fred Momotenko to interweaving music, dance and multimedia with each other is in all respect admirable, (Radio 4, blog Eigentijds). - Fred Momotenko, who previously interviewed by Thea Derks for Radio 4, Eigentijds and Muziekvan.nu, has presented Cloud Messenger, the three quarters of dance, projection, acoustic block-flutes sounds and electronics. It has provided a solid multimedia spectacle (Muziekvan.nu, website about 20th and 21th century music). -Spannend! Ingenieus in elkaar gezet! (Radio presenter, acteur Edwin Rutten). - A real Multi Culti event! Bravo! (Radio 6, VPRO , Radio Concert Live, Cafe Sonore program). If you wish to watch some exepts, please follow this link (opens new windows).